At The World Peace Prayer Society- Allanton Sanctuary, each totem guardian for the garden gate embodies an element from nature and the animal kingdom. A planetary guardian carved from Hawthorn, watches over from one of the pillars. 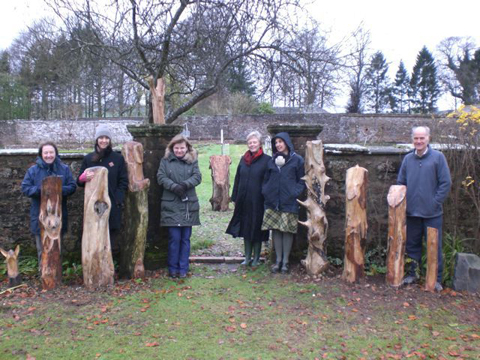 The wood used has been taken from the grounds of Allanton Sanctuary. The Elm, Holly and Hawthorn wer standing dead trees. They have been brought back to life with new purpose. Sculptor and friend, Richard Brockbank, says “I am pleased with the sculpture as a whole. It provides a welcome and at the same time there is a lot that can be discovered by taking time to explore the details which are not at first obvious – the rabbit at the base of one of the columns and the butterfly on top of another, for example. The form of the wording on the welcome post inside the garden, ‘Well Come to our Garden” is also done deliberately to encourage people to stop and notice the specialness of the place” The dedication plaque reads: ” Garden Gateway Sculptures. Gift of the Goi Peace Foundation to Allanton Sanctuary. In honour of our mutual values: Reverence for Life. Respect for All Differences. Gratitude for and co-existence with All of Nature. Harmony between the Spiritual and Material.